I’m sure all of you have your own family-centric holiday traditions. Well, one of mine is a Christmas Eve fondue. 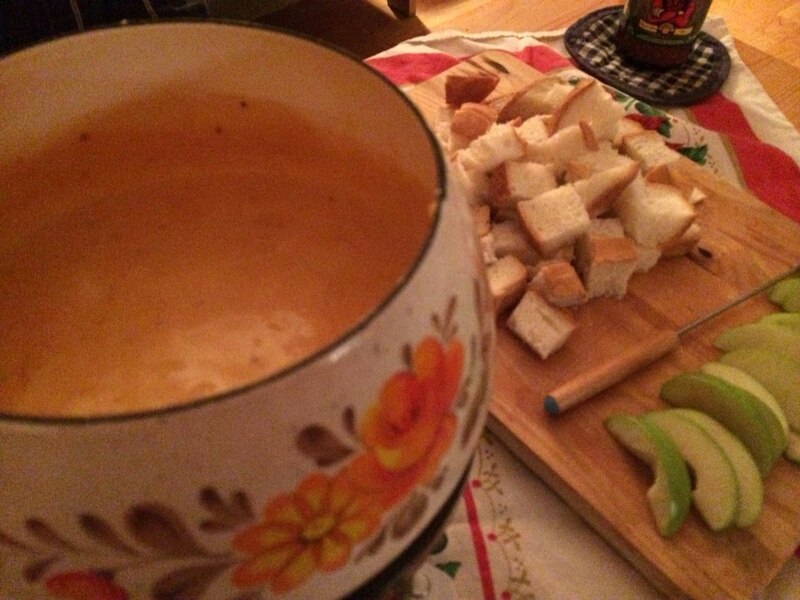 I do love to fondue… I mean, c’mon, what’s not to like? Lovely, soft pieces of bread, dipped into warm, gooey cheese. You really can’t go wrong. Just add a glass of wine and The Grinch (classic animated version, please!) for me, and hot chocolate and Charlie Brown Christmas for the sprout, and you have a perfect Christmas Eve. Last year’s Christmas Eve fondue. Don’t you love my “vintage” 1970’s fondue pot? We usually wrap up the evening with a chocolate fondue. Because, really, the only thing that can make a fondue better is another fondue. Made of chocolate. This year’s recipe comes from Chef David Robertson, owner of The Dirty Apron. You’ll remember I just got his cookbook recently. This recipe, however, is not in the Dirty Apron Cookbook. He developed this one in association with Jackson-Triggs, and the recommended pairing with this fondue is the 2010 Jackson-Triggs Okanagan Valley ENTOURAGE Grand Reserve Sparkling Brut. Could you serve Prosecco with it? For sure. But the JT is a more local choice. By the way, if you have any left over (HA!!) you can make this sparkling cocktail to have with your Christmas Brunch tomorrow. Speaking of local choices, I’d use the Cows Applewood Smoked Cheddar from PEI to make this (Whole Foods). It’s my absolute favourite. Happy Christmas Eve! Cuddle up with some cheese and wine and The Grinch, and relax. In a small bowl, coat the applewood smoked cheddar with cornstarch and set aside. Rub the inside of a ceramic fondue pot with garlic, then discard. Over medium heat, add the wine and lemon juice into a saucepan and bring to a gentle simmer. Gradually stir both cheeses into the simmering liquid, melting it until smooth in consistency. Once smooth, stir in the calvados, mustard and nutmeg. Arrange an assortment of bite-sized dipping foods, such as pieces of French and sourdough breads or blanched vegetables like carrots and asparagus on to a plate. Spear the pieces with fondue forks or wooden skewers, dip and enjoy.